While most of the Happy Tree Friends lead lives of innocence and bliss, there are a few who don't. Some have problems beyond how much sugar is in their lemonade or whether it's been an hour since they ate so they can go swimming. Some have been out there, man; they've seen the world and know how The Man behind the curtain does his crazy dimestore dances. Flippy's been out there, man; he's been out there and there ain't never no coming back. Emotionally tattered, this bear veteran will warm your home and leave no witnesses. 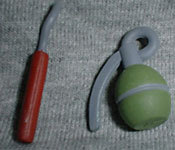 Flippy survives most of his appearances on the show, mainly because he's the one dealing out the deaths. In his "normal" mode, Flippy's just about the happiest little bear you'd ever hope to meet, but once something sets him off? Duck and cover. For now, Flippy's flashing us a big, buck-toothed grin: he's full of love! He stands 4 3/8" tall, but his little beret adds just a little more to that total. He moves only at the neck, shoulders and hips, which isn't very much, but could be worse. The shoulders are balljointed, giving Flippy a decent bit of motion - decent, but not great. He could at least have some wrists or something, where his hands poke out of his sleeves. Proving that while he may have left the jungle, he'll never leave the war behind, Flippy still wears his camouflage jacket, his dogtags and his beret. These are actually sculpted parts of the figure, which is nice - even the rank chevrons on his shoulders are more than just paint apps. Judging by his three downward-pointing insignia, Flippy was a probably a sergeant in either the Navy or Air Force. Flippy's skin (fur?) is light green, while his clothes are a darker shade. The camo pattern on his jacket is painted in browns with a dark green outline. His dogtags are grey, and the cord they hang from is a nice black. There are no errors with the paint apps, which is surprising considering how many details there are. All very nice. This deluxe set comes with more than a few extra bodyparts, though it's not really clear why. The rest of the Happy Tree Friends have a spare pair of limbs or something simple, but the Flippy set comes with two complete figures - one happy, one insane. Why two? No idea - Stevenson could have gotten away with just an extra head, and if they'd done that, they could have made Flippy a one-stop source for all sorts of death-dealing accessories. Not that this little bear is empty handed, though: he comes with a stick of dynamite and a hand grenade; it's just that he could have had so much more. Angry Flippy's hands have individual fingers, rather than the fingerless mits the other Friends have - all the better to hold his weaponry. Additionally, the beret on his flipped-out head is reversed - it folds to the left, rather than the right. 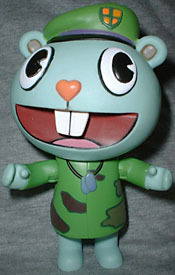 Not sure why this is - could be an intentional choice, showing Flippy's mental shift, or it could just represent the Happy Tree Friends' low-budget animated origins - easier to just flip a character model than try to redesign a second side, and when you do that, asymmetrical details show up backwards. 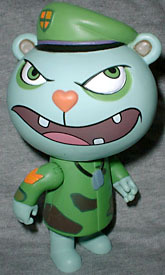 Flippy comes with a grassy knoll display base with the HTF logo on the front. It's simple, but it works and gives the figure a little added value. Granted, these figures are still about twice as expensive as they should be, so you should probably hold off until you find a nice clearance sale. Flippy could have really been a standout, had they given him more accessories - a bear trap, a machette, some candy, a lawnmower... things that all the figures could have used. It would have made Flippy a must-buy, and might have helped move the other Friends, as well. Who's your favorite crazy vet? Tell us on our message board, the Loafing Lounge.